Most photographers will do whatever it takes to get “THE" shot. We usually don't think that we're taking any chances until it's too late and something happens. That is what happened to me. I’ve been doing professional photography for the past three years and never seriously considered photography safety until I got injured on a shoot at Lake Tahoe. My wife and I love the outdoors and shoot commercial and nature photography throughout Northern California. On our journeys, I’ve seen photographers and models take unnecessary risks to get that “WOW" shot. We all want to be different and have our photo stand out but how far are you willing to go? 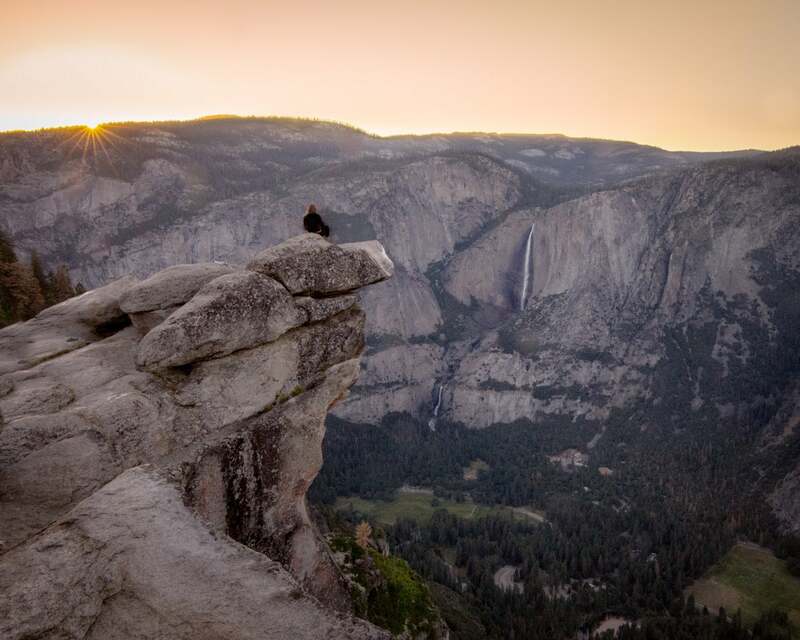 Karl Zoltan at Taft Point, Yosemite National Park, CA. Are you willing to hang your feet off a cliff or a high rise? 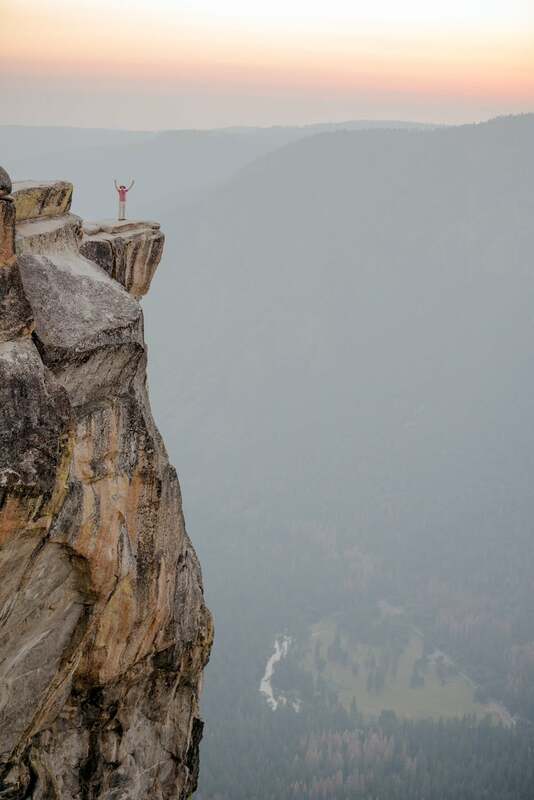 What about doing a back flip on the edge of a 1,000-foot granite cliff at Glacier Point in Yosemite? I must admit, I got the WOW factor from looking at these pics but then said to myself, “why”? To reach this point, the unknown hiker ventured past signs that are posted to keep out due to safety concerns. And it’s not all just about injury. A friend of mine lost his tripod and camera when they fell off a cliff because he got too close. $5,000 down the drain. I’ve had friends sprain their ankles walking without looking where they were shooting. Photographers get in the middle of roadways and train tracks to get fantastic shots without being totally aware of the traffic. Is this worth it? 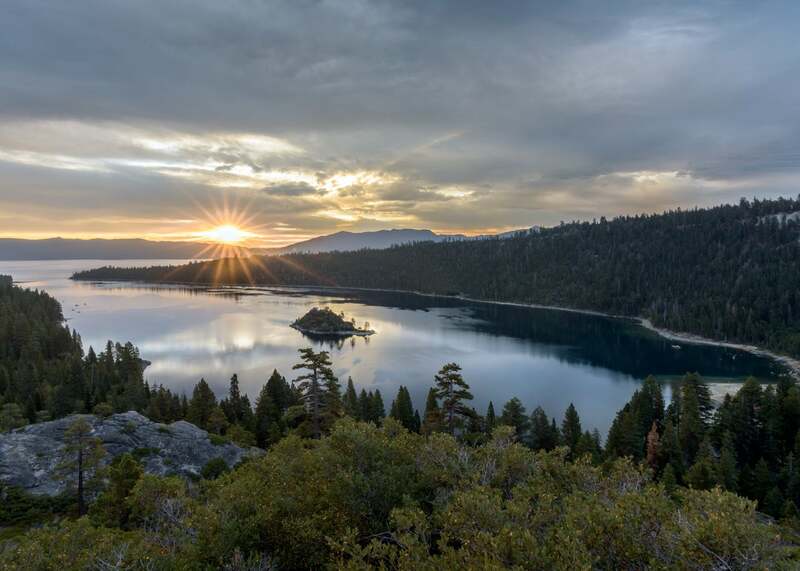 On my fateful day, I went to shoot the sunrise at Emerald Bay in Lake Tahoe, California. I left my wife at the hotel so she could sleep in. I thought I’d go out and take a few shots then come back before she woke up. I was wrong, almost dead wrong. I stopped by Eagle Falls for a quick picture. I walked down to my favorite spot two tiers down which has a great view of the falls. I set my camera bag down then walked to the falls to get a video of the falls. There was a low flow so I thought it would be a great idea to put the selfie stick over the edge for a spectacular video. I saw a 4” ledge with a rock next to it. I put one foot on the ledge, leaned on a rock with one hand for balance then put my camera over the edge to get my shot. Karl Zoltan's photo from Eagle Falls. The allure of this vista is obvious, but if one isn't mindful of the dangers, getting the shot can end in tragedy. 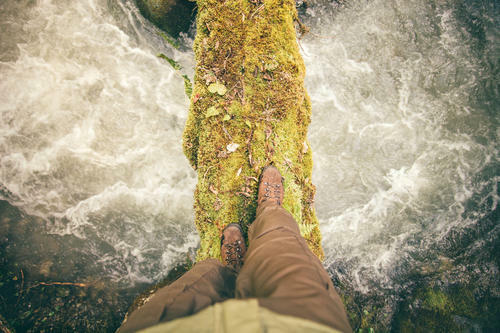 It was a great idea until my weight transferred to the foot on the ledge and I immediately slipped on the mossy slime. The next thing I knew I was in the middle of the flow falling down the falls. I bounced off the rocks until I landed on the ledge in the bottom of that section. 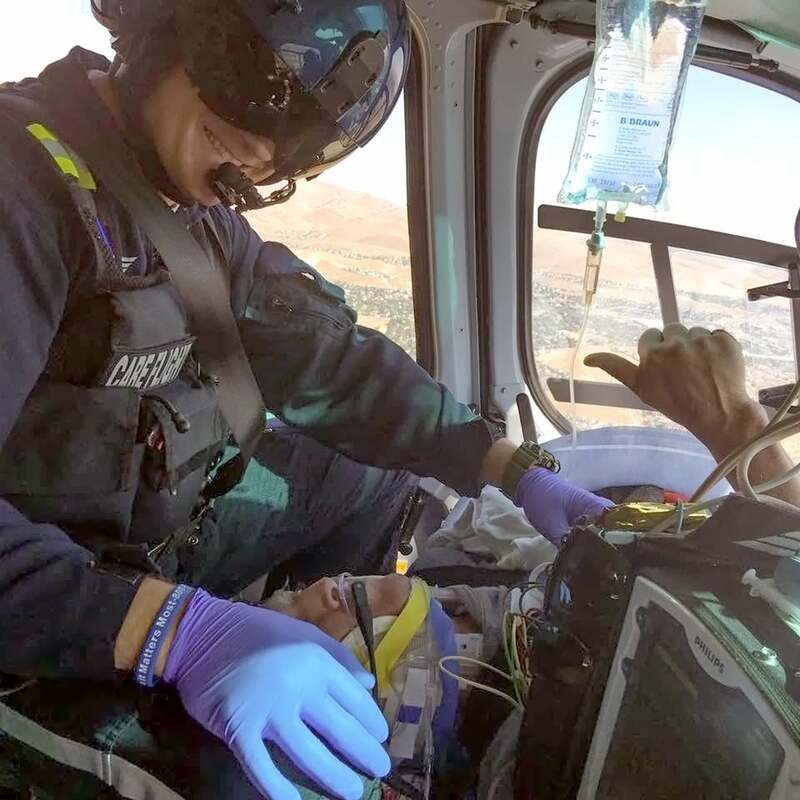 Two hours later I was in a Life-Flight air ambulance to the Renown Hospital in Reno for treatment. Although I had many injuries, I was very fortunate to get back to 100% in six and a half weeks. I heard about these types of accidents and never thought it would happen to me. To be honest, I never wanted to be “THAT" guy, but there I was. Karl Zoltan's accident could have been much worse. Seen here in the helicopter as he was flown to the hospital, Zoltan made a full recovery. You can avoid being in this position by adhering to some simple, mostly common sense guidelines. After the accident, I’ve created a list of safety procedures that I follow now. Mostly, these are just common sense practices, but it’s surprising how few photographers actually behave with common sense. I hope you’ll learn from my experience and make these procedures part of your photography regimen. 1. Shoot with a partner. Two pair of eyes are better than one. If you do get hurt they can help you or get help. 2. Follow the posted rules. For example there are clearly marked signs at Bridal Falls in Yosemite complete with a fractured skull x-ray on them stating stay off the rocks. I still see lots of people out on the rocks anyway. 3. Get to your location safely. Be aware of holes, rocks, branches, wire, water, moss, snow, ice and animals enroute to your location. We carry a lot of gear and are top heavy so make sure you don't lean back on steep grades. Have proper clothing, boots or shoes. 4. Once your at your location, scout the immediate area your going to shoot before you start taking pics. Once you find a spot, walk exactly where your going to shoot to check stability and footing. Too many times we focus on our subject or what we're shooting. We move to get different angles and suddenly are in an unfamiliar area and don't really know what we're walking in to. 5. Park on the side of the road in a straight section of roadway. When we are out shooting, we frequently see a spot where we just have to pull over immediately and get the shot due to light or whatever it might be. Most of the time it's on curvy mountain roads. We've had near misses getting our gear or getting in and out of the car or even when we pull back into the road way. The same goes for making a u-turn to get back to the spot you want to shoot. It's better to park safely and walk to get the shot or to make a u-turn in a straight section of the road. You may think your safe when you go out and take pictures and this is common sense, but remember to make safety a priority. Injuries happen when you least expect it. One mistake can be your last. I was lucky and don't want anything to happen to you. Get out there and be safe! Karl Zoltan is a member of the Sony Alpha Imaging Collective. You can follow him on Instagram @karlzoltan.